RAMALLAH, West Bank (AP) — The Palestinian president said he has rejected a conditional Israeli offer to let Palestinian refugees in war-torn Syria resettle in the West Bank and Gaza, charging it would compromise their claims to return to lost homes in Israel. Palestinians in Syria are descendants of hundreds of thousands of Palestinians who fled or were driven from their homes in the war that followed Israel's creation in 1948. Uprooted Palestinians and their offspring, now numbering several million people, cite U.N. resolutions in claiming the right to return to the property they left behind. Abbas said he asked U.N. chief Ban Ki-moon last month to seek Israeli permission to bring Palestinians caught in Syria's civil war to the Palestinian territories. The request came after fighting between Syrian troops and rebel fighters in Yarmouk, the largest Palestinian refugee camp in Syria. About half of the camp's 150,000 residents have fled, according to a U.N. aid agency. 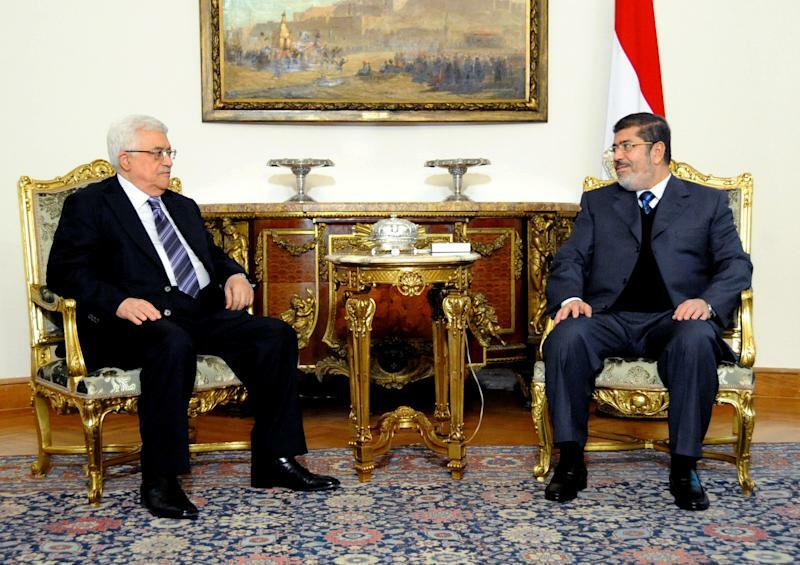 Abbas told a group of Egyptian journalists in Cairo late Wednesday that Ban contacted Israel on his behalf. Abbas said Ban was told Israel "agreed to the return of those refugees to Gaza and the West Bank, but on condition that each refugee ... sign a statement that he doesn't have the right of return (to Israel)." "So we rejected that and said it's better they die in Syria than give up their right of return," Abbas told the group. Some of his comments were published Thursday by the Palestinian news website Sama. Officials in Israel's Foreign Ministry and Prime Minister's Office declined comment Thursday. The Israeli condition linked to the resettlement offer made it impossible for Abbas to accept, said Ahmed Hanoun, an official in the refugee department of the Palestine Liberation Organization, the umbrella group Abbas heads. "I think the Israelis were not serious about this offer," said Hanoun. "If they were, they would have endorsed the return of these people who live in misery, and not to blackmail them to relinquish their legal rights." U.N.-mediated contacts between Israel and Palestinian President Mahmoud Abbas concerning the Palestinians in Syria marked the first time in years the two sides have dealt with a practical problem linked to the refugee issue. Bringing tens of thousands of Palestinians from Syria to the Palestinian territories would be a large burden, as Abbas' self-rule government is dealing with a severe financial crisis, while the Gaza Strip, run by his Hamas rivals, is impoverished and crowded. Some 4 million Palestinians live in the West Bank, Gaza and east Jerusalem, territories Israel captured in the 1967 Mideast war that the Palestinians seek for a state. Israel occupies the West Bank and east Jerusalem and continues to control most access to Gaza after withdrawing from the territory in 2005. In addition, several million Palestinians live in neighboring Arab countries, including more than half a million in Syria. The fate of Palestinian refugees is an explosive issue that has loomed large in the failure of Israeli-Palestinian peace talks over the past two decades. Israel maintains that a mass influx of Palestinians could destroy the Jewish character of their state, and there is broad consensus there against a large-scale resettling of Palestinian refugees. Abbas, meanwhile, would face a massive backlash from his people if he were seen as compromising on the refugees' decades-promised "right of return" to lost homes. In previous rounds of Israeli-Palestinian negotiations, several ideas were floated, including allowing for a limited return of refugees to what is now Israel and settling the rest in a future Palestinian state and third countries. Talks broke off four years ago. Associated Press writer Maggie Michael in Cairo contributed.